Matthew was introduced to climbing when he was 7 years old through a trip to the UK Lake District, however for many years, competed in squash at national level. The early years outside school and university were spent mostly on the squash court, however in 2010, the opportunity arose for Matthew to venture out to live in the French Alps for 3 months. This experience ignited a true hunger for the great outdoors which had been bubbling away for over 13 years. It was in the basement of a French hotel in 2010 when Matthew finally decided that he was physically and mentally prepared to take on the challenge of training and fundraising, to ultimately climb Mount Everest. 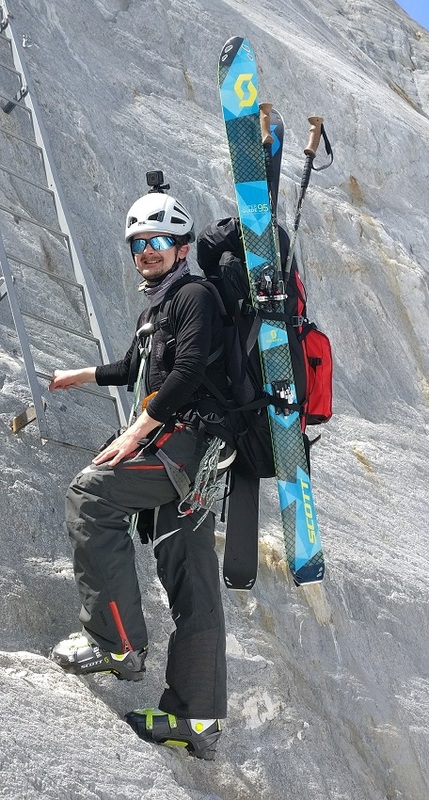 Since that first climbing trip aged 7, Matthew has completed many climbs both in the UK (specialising in Scottish winter ascents), and in the French, Italian and Austrian Alps. More recently, Matthew has been on a number of expeditions to climb some of the world's highest mountains including to the remote Gorno-Badakhshan region of the Kyrgyzstan Pamirs and to the Nepalese Himalayas which included a successful ascent of Everest in 2012 as part of the youngest team to climb the mountain. Whilst climbing mountains is a large part of Matthew’s life, his first passion is flight. Despite being a paragliding pilot, Matthew mostly flies small, agile canopies known as speed wings. Speed wings give endless options in the high mountains, both on foot for speed flying, or on skis for speed riding. Matthew is continually perfecting this art which, whilst fundamentally more difficult than purely climbing and descending, actually removes a large element of danger involved in mountaineering which is renowned to be the descent. Whilst speed wings were designed primarily to fly in close proximity to mountainous terrain at the lower altitudes, it is the high altitude flights which Matthew prefers, carrying the comparatively small weight of the wing to the top, and subsequently enjoying often ‘sporting’ launches typically making it back to the valley in little over 3 minutes. Whilst seemingly fundamentally opposed, climbing and flying go hand in hand due to the unparalleled possibilities of combining both sports since the evolution of modern climbing and flying equipment. Flying is currently revolutionising the world of climbing and will continue to do so as it opens up projects which were previously not possible; the number of mountain guides now trained as paragliding pilots is testament to this successful integration of both sports. Working with partners and sponsors, Matthew is currently focusing on a number of modern fast & light expeditions and objectives in Europe and the Himalayas which are primarily focusing on the use of speed wings to both enhance the adventure, but also to make certain fast and light projects a possibility. The latest project Matthew is working on is known as #RidingGiants with further details being released when available. Matthew is a fellow of the Royal Geographical Society, and whilst not on expeditions, flying, surfing or training on the road bike, can be found at the Entrepreneurship Centre of the Said Business School, University of Oxford. Finally, Matthew supports Global Angels, a charity dedicated to children around the world who are in need of aid. Matthew specifically supports the Global Angles water foundation, which aims to give the opportunity of fresh, clean drinking water to every child on the planet. To find out more about their work with Matthew, please visit the Global Angels website.